My 4th day in Prague marked the first of the work related events. The morning started out at the Staropramen Visitor Center with a tour through the automated Staropramen experience. Tours are offered in Russian, German, English, or Czech. After you get ticket, your group is ushered into the first chamber and the program begins. A fun/interesting phenomenon of English speaking tours is that due to the ubiquity of the English language, you’ll often tour with people who English is a second language (and for some, a not very good one). Each room of the tour leads you through a part of the history of the brewery as well as the brewing process. 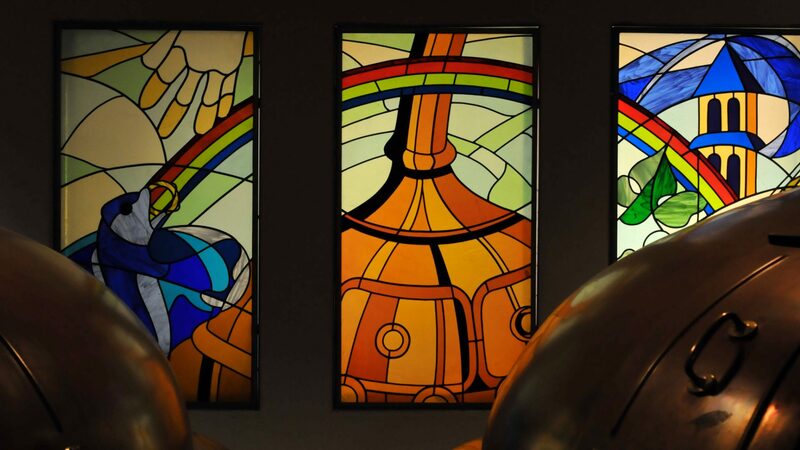 Through a serious of videos and animations accompanied by audio recordings, you understand the history of a Prague’s largest and the Czech Republic’s 2nd largest brewery. For me, my favorite part of the tour is the last portion where you can see how the beer gets from the brewery to your part of the world. Even though I know that process intimately (it’s what pays my bills), it’s still exhilarating to see how interconnected the globe is when it comes to getting your drink on. I also would like to think that after people see this section of the tour, they’ll have a greater appreciation for just how much work and how many people it takes to get 330ml of liquid 10,000 miles to say the West Coast of the United States. At the end of the tour, you can try one of the famous Staropramen beers. Your options are: the classic Staropramen pils-style beer, an unfiltered version of the classic Staropramen, Granat (a smooth amber lager), and a Cerne (a roasty dark lager). Any of these beers are an excellent choice. Don’t feel that you have to sacrifice one for the other. If you go into any of the Staropramen bars around Prague, you’ll be able to find most of these available. One that isn’t available at the visitor center is the 11º lager. This is a newer beer that, flavor wise, sits somewhere between the classic and the granat. After our lunch at a nearby Staropramen property, our tour guide, Helena Martinkova, showed up with our cars. A few minutes later, we were dropped off at Strahov Monastery for our appointment inside their legendary library. Fortunately, we were running early and had time to stop off at the Strahov Monastery BREWERY! And if you’ve even spend the most casual amount of time on I think about beer, you know I have a vast passion and love for monastic breweries. The beers, also known as St. Norbert Brewery, featured a range of styles from traditional Czech lagers to seasonal ales, including a hop heavy IPA or two. The 5 of us ordered one of each of the beers and shared them. The beers were exceedingly excellent. You can find them in a few places around town, but your best bet is to head up to Prague Castle and stop off at Strahov Monastery to enjoy them at the source. Beers down, geeking done; it was time to fulfill our appointment with the famed library at Strahov. You can visit the abbey and peak inside the library structure, but you can’t go in without a proper appointment. The libraries are lined with hundreds and hundreds of ancient books on all subjects. In addition, the ceilings are covered in glorious murals depicting an amalgum of biblically themed images merged with historical figures important at that time during the Hapsburg empire. Everywhere you look there are artifacts more interesting than the last. For a history geek and book geek such as myself, it’s almost sensory overload. I could have literally spent hours just ogling everything. It’s one of those situations where you feel like a little kid who has to keep his hands in his pocket or firmly clasped behind his back because I WANT TO TOUCH AND LOOK AT EVERYTHING!!! It’s days like that and getting to see places like Strahov that make me happy about the career choices I’ve made. I don’t make a lot of money; but damn, the experiences are off the charts! After Strahov, Helena showed us around Prague Castle and gave us all the fun facts you want. Incidentally, Prague Castle is the world’s largest currently occupied castle and functions as the Presidential Palace. The inside tour of St. Vitus Cathedral was particularly informative. To the uninitiated, a cathedral is a jumble of stained glass and art works with no connection to the “whats” and “whys.” As a student of history, I have a pretty good grasp on 3,000 years of Western European history. However; Prague, Bohemia, and the eastern portion of the Hapsburg Empire are a bit thin on the details in comparison. Fitting the pieces into the global puzzle was enlightening. This was the first time I’ve experienced a full on tour guide. I highly recommend it. The local knowledge and historical context was priceless. Prague Castle is an epic site to see and experience, even though this was my 2nd time visiting it. Every visit to Prague should include some time up on the hill overlook one of the crown jewels of European culture. Somehow, and let’s be honest, my phone knows me entirely too well. It helped Google Maps get me lost right next to a karaoke bar. Well, that was the evening. We walked down into Poison Bar and joined the sparse Tuesday night crowd. The karaoke book was loaded with English language rock classics. Since 3 out of the 4 of us were Karaoke junkies, the night quickly devolved. Cold glasses of Krusovice 10º and Cerne fueled a night of international karaoke fun. I’ve always wanted to sing karaoke someplace outside of the US, but this was the first time I’ve been able to manage it. It was hugely fun. There were a couple small groups of Belorussians and 4 American guys along with our Czech bar staff. Our KJ belting out a song with some Belorussians.